Over the past eight years, Ikebe Shakedown has cemented a reputation as one of New York City’s boldest, most creative instrumental bands. Combining cinematic soul, Afro–funk, deep disco, and an irrepressible groove, Ikebe Shakedown has forged a style all its own. Each song is anchored in the deep-pocketed pulse of its four-man rhythm section (Barnaby Alter, drums; Dave Bourla, percussion; Vince Chiarito, bass; Robin Schmidt, guitar) and driven by one of the tightest horn trios on the East Coast (Mike Buckley, tenor/baritone sax; Jason Colby, trumpet; Nadav Nirenberg, trombone), with tunes ranging from dance-floor burners to lush, captivating scores. 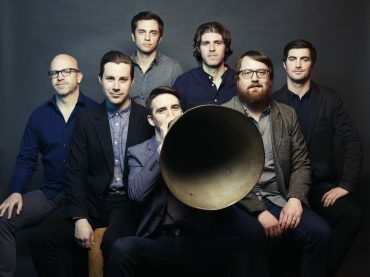 Now, after hitting major jazz festivals, opening on extended runs for stars like Lee Fields, and with the band’s members simultaneously touring with acts like Sharon Jones and the Dap-Kings, Charles Bradley and His Extraordinaires, and the Monophonics, Ikebe Shakedown is poised for their next big release in 2017. The new album, The Way Home, is due out October 20th on Colemine Records. It shows how the band’s style has continued to evolve, with material that transports listeners beyond their living rooms into dance parties and spaces for introspection. Building on the success that has led to musical features in series such as Eastbound and Down, movies like Our Brand is Crisis, and commercials for brands including Mini Cooper, Vans’ Off the Wall, and Surfline, the songs are at once richly familiar and incredibly fresh, paying homage to classic influences while pushing a brand new sound. Defying genre or classification, this album proves Ikebe Shakedown is helping define the next bold and soulful wave in instrumental music.